Kommerniemen Mökkilomat rents six cottages that are located at the distance of a few kilometers from the host family’s home. All the cottages are lakeside cottages that can be reached by car. Each cottage is equipped with a rowing boat and life jackets, and has a stretch of shoreline with a small jetty. We also rent outboard motors. The cottage equipment includes dishes and cutlery, duvets and pillows, and for extra charge, you may rent bed linen. For detailed information on the equipment in each cottage, please refer to the additional information. 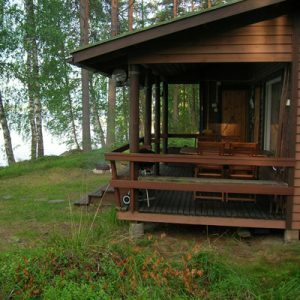 Rananiemi is the largest of the six cottages and fully equipped. The shore is well suitable for children’s play and for swimming, and there’s a wood-heated lakeside sauna cabin. This cottage is rented also in winters. Villa Leikon is a log cabin fit for winter living which was renovated in 2015. The detached sauna building, with an open terrace, was built during the renovation in 2015. The sauna building also has a spacious bedroom for two persons. Villa Leikon is a comfortable family cottage with nice lakeside. The idyllic Kot’mäki huvila is built on a steepish slope. In addion to the villa, there is a roofed barbecue on the cliff bank, and a separate lakeside sauna cabin. Kot’mäki apparently pleases its visitors, because many of the guests are renting it year after another. Even though Haapio is the smallest of the cottages we rent, it easily sleeps six people. The cottage itself has space for two and the old log granary has more sleeping space. The surroundings of the cottage are spacious, and the veranda is perfect for enjoying the evening sun and the whisper of the lakeside birches. Varila and Mäntylä are alike and situated closely to one another. These simple 2-person cottages have beds for two and extra beds for another two. These lakeside cottages have an air of genuine Finnish cottage holiday.